Does the iPad need Microsoft Office to succeed? With all the new screen real estate that the iPad affords, it's a great candidate for an all-purpose reader device. While iBooks offers a lovely interface for e-books, there's also all those other files that clutter our desktops: PDFs, documents, spreadsheets, presentations, HTML pages, high-resolution images, and more. Luckily, Good Reader, one of the best all-purpose readers for the iPhone and the iPad Touch, is ready for the iPad's debut. 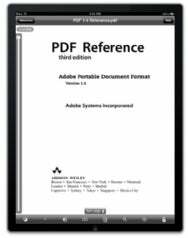 GoodReader Tablet Edition is identical to its iPhone counterpart, best known for its ability to open and cruise through large files—especially PDF files—that would bring other apps to their knees. Exclusive to the iPad version is a brand new preview control panel, giving you a whole new column to take a quick peek at the contents of all the files uploaded to GoodReader. On top of that, GoodReader Tablet Edition has all the features that made GoodReader a solid preview app for smaller screens. Apart from mainstays like Wi-Fi syncing with your computer, GoodReader also supports syncing over the Internet with convenient cloud-storage services like MobileMe’s iDisk, Google Docs, and Dropbox, as well as several lesser known services such as Box.net and MyDisk.se. To make reading files even more convenient, GoodReader keeps track of progress as you follow hyperlinks, so you can tap the “go back” button at any time to quickly head back to an index or undo your erroneous hyperlink mashing. Documents and images can be zoomed up to 50x normal size, to observe the tiniest details of a very high resolution picture or read the finest of fine print on a legal document. 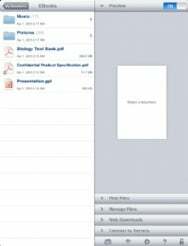 GoodReader Tablet Edition works with most Office documents (doc, xls, ppt and more), iWork '08/'09 files, HTML and Safari webarchives, and most popular image, audio and video formats. It is now available in the App Store for the limited time introductory price of $1, and requires an iPad running iPhone OS 3.2 or later.